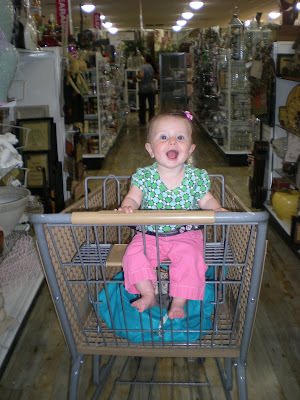 ~She sits in a shopping cart and is so much happier to look around and grab onto everything around her. 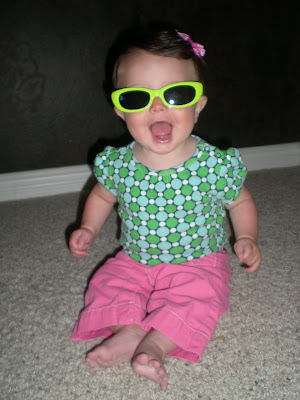 ~ I can dress her up and she thinks it's hilarious! ~ She loves animals! 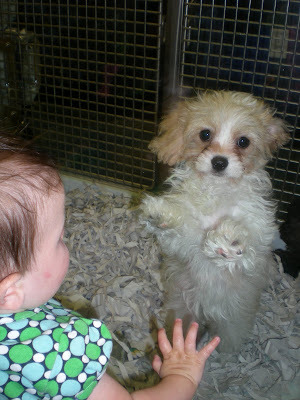 I took her to a pet shop to see the puppies and she couldn't get enough...all thanks to Nugget! 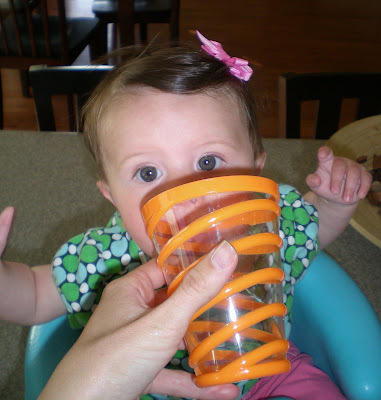 ~She drinks water out of a cup! 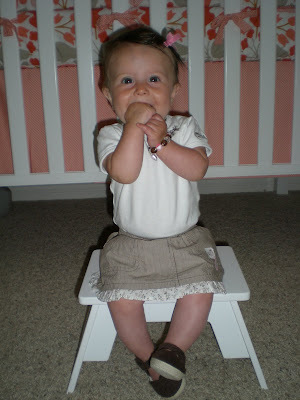 ~ She can sit on a step to have her picture taken in her other adorable Easter dress from my mom! ~I can put her in a box! 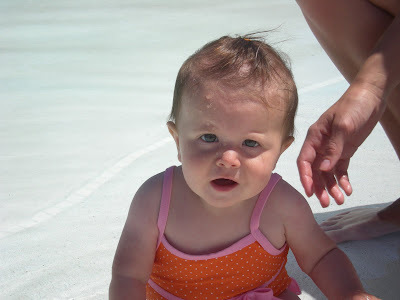 ~She loved her first time to the pool! ~She doesn't mind water in her eyes! 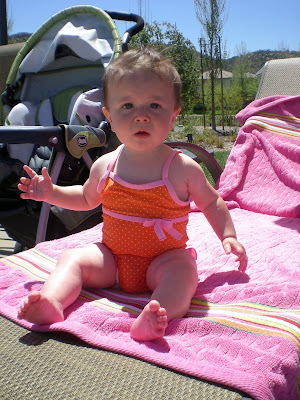 ~ She loves being outside and laying out with herMom...she also has no choice! 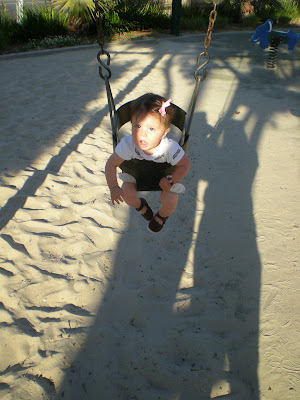 ~ She can swing at the park! ~ Who couldn't love this face and this outfit?! It is so much fun being Camryn's mom. I am entertained everyday and my time with her just keeps getting better! Awwww. No kidding, who can't love a sweet pretty munchkin like Camryn. I can't believe how grown up she's getting. Is she pulling herself up in her crib yet? If not, it seems that might be just around the corner for her! And I love my 6 month old because she has taken over grandma and grandpa's heart! 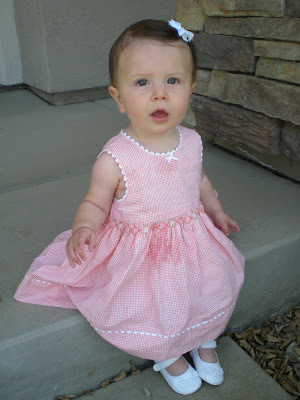 Oh my heavens, I never knew life could be so fun (with much cuter clothes) having a girl!?! However, she is growing up WAY too fast! Love you baby girl! 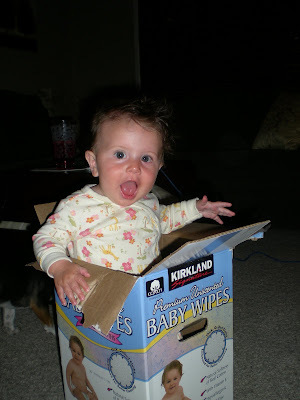 I loved that age too, it starts becoming so much fun! Camryn is so adorable! I so can't wait to see her again. What fun! I kind of miss having one baby and all the excitment that comes with each new skill. Too bad Emma and Camryn couldn't be twinners on Easter. Maybe in a few weeks! PS did you make Camryn's bedding? She is getting so BIG! And she is such a little cutie. Life is so much better when they can sit up. Hudson finally has it mastered! And you are so right about the shopping cart...they love just seeing the world around them. she is so cute! i can see both of you in her now. and yes-- riding in the cart is awesome..for baby and mom! no more annoying infant carrier in the store! She is the cutest thing and getting so grown up. I can hardly wait to see her. June 6th is too far away! I am grumpy because my original comment didn't post for some reason and I can't remember what witty things I said. I am loving all her little shoes! 6 months old is truly a magic age and you can tell by her happy open mouth grin that she is enjoying all her adventures too! Having a water baby is the best! what fun pictures! What a fun girl! Totally love to outfits. She does look like she thinks the sunglasses are funny. So with the magic 6 mo...how is she taking to food? what a little sweet pea. i just don't think she can get any cuter. I do love the last picture, the outfit is adorable and the shoes are to die for. just when you think it can't get any better or funner, it totally does!!! (i know funner isn't a word). so dang cute! I cant wait till Brady can sit up on his own like that. He can do everything else but that! What a fun age!! !